In 1961, Bob Barczak joined the staff of a small educational outpost known as Sweet Home High. 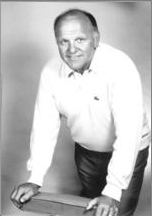 Although he was hired as a physical education instructor (and later coached wrestling and football), Bob soon hungered for an expanded role which would enable him to have an impact on the entire sports program and all of its participants. In 1964, Bob was appointed athletic director at Sweet Home, and the program flourished. Over the next 25 years, Sweet Home athletic teams compiled an amazing 72 percent winning percentage, winning 10 regional championships and five New York State championships. The school captured 16 Clarkson trophies (symbolizing supremacy in all sports for a given year in the ECIC) in 17 years; in fact, Sweet Home’s dominance led to the eventual discontinuation of the award. Amid the incessant winning, several highlights stand out. In 1983-84, the boys’ basketball and baseball teams captured state championships; that, along with the characteristic dominance of Sally Kus’ girls volleyball team, led the Buffalo News to select that year as the greatest single sports year enjoyed by any Western New York high school in the past 50 years (several Sweet Home years during Barczak’s tenure were finalists for this distinction). Of course, no mention of Sweet Home athletics would be complete without reference to the Lady Panthers’ national record 292 match winning streak in volleyball. Barczak has been recognized for his tireless devotion with awards, citations and championships far too numerous to mention. Besides, Bob would certainly rather see the young athletes bask in the glory of their accomplishments. However, Sweet Home coaches and players have always recognized that the unbridled support their of athletic director was the key to their good fortunes. The volleyball success story sprang from Bob’s total commitment to girls’ athletics long before Title IX mandates. As Kus acknowledged, “…without (Bob), all the records we accomplished in girls’ volleyball could never have happened.” He approached all sports with the same dedication and ultimate interest in the physical and academic well-being of his young charges. A crack administrator, Barczak was always able to attract and assemble an athletic staff of top coaches and trainers to ensure the continuation of the Panther tradition. The Barczak mantle is surely a crowded place, but tonight Bob’s former students and coaches surely hope that he will find a space for the hardware emblematic of his richly deserved induction into the Greater Buffalo Sports Hall of Fame. The biographies contained on this website were written at the time of the honoree's induction into the Hall of Fame. No attempt has been made to update these narratives to reflect more recent events, activities, or statistics.